I just had to snap some pictures and share the fun before these were all gone. 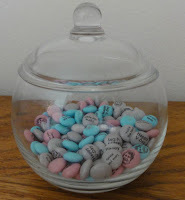 Did you know that you can have personalized M&M candies made for any occasion? 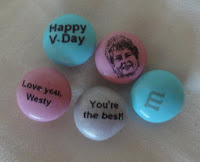 You can choose your colors, add short messages, and even have your sweetheart's picture printed right on the candy. For Valentine's Day this year, my hubby gave me a cute glass bowl full of these. What a sweet surprise! A personalized gift like this tells the recipient that you care enough to put some real effort and planning into the occasion. You can't just stop at the supermarket on the way home and pick up a bag of these! That is a brilliant idea, and it shows you put thought into it by putting your words in print. Lovely.